Soon after we made Aliyah in January 2010, my son and I created mini videos for our friends and family back in NJ with our Flip camera. 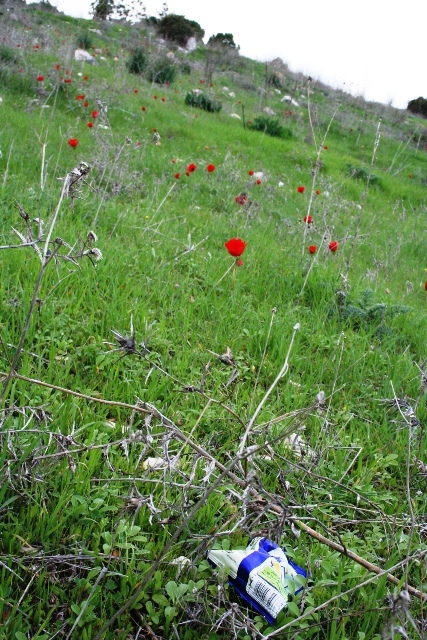 At the time, the kalaniyot were just beginning to bloom here in the North and there is this poignant moment during one of our virtual walking tours of Hannaton where my son, in the middle of some explanation of a particular cultural difference between the U.S. and Israel, stops walking, bends down, gazes at, and then plucks from the ground a beautiful red anemone. 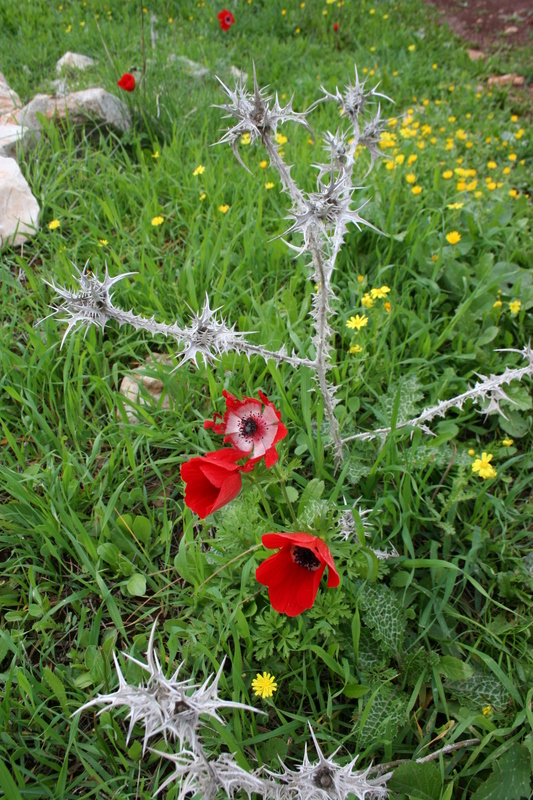 We learned soon after that these flowers are on the endangered list here in Israel, and it’s forbidden to pick them. The kalaniyot (anemones in Hebrew) are so breathtaking it’s no wonder they caught my son’s ever wandering eye, and it’s no wonder they beckon us all to the fields when they start to pop up in January. If you do a Google search for pictures of kalaniyot, you’ll see what I mean. I’ve been eager to go on a photo expedition myself among the kalaniyot on Hannaton, but I put it off due to sickness and continual bad weather. 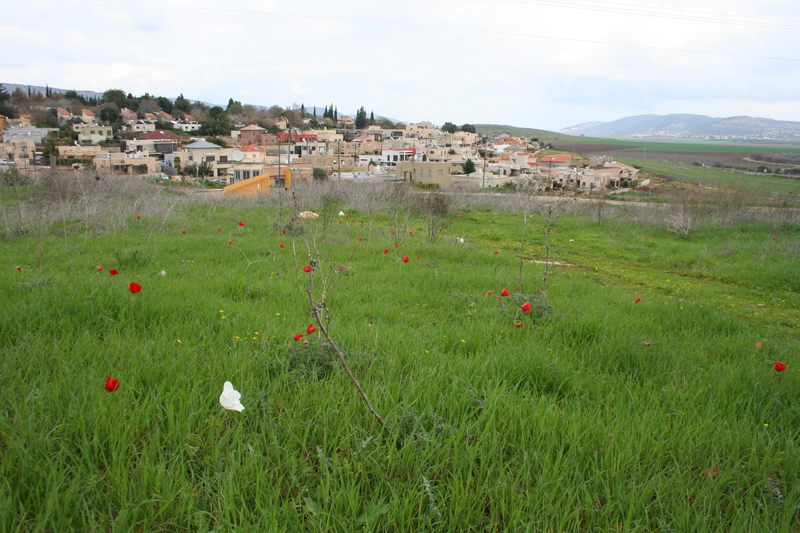 Finally the rains stopped enough for me to take a quiet Shabbat walk this past weekend to the fields above Hannaton overlooking nearby Kfar Manda and the Eshkol reservoir here in the Lower Galilee. What I found was, as I expected, overwhelmingly and breathtakingly beautiful. And, at the same time, heartbreaking. Heartbreaking in that as much as we revel in Israel’s beauty, and as much as we fight for ownership of her lands, we fail her. Do you see what I mean? We are prohibited from plucking her beauty, and perhaps rightfully so, in an effort to preserve it. 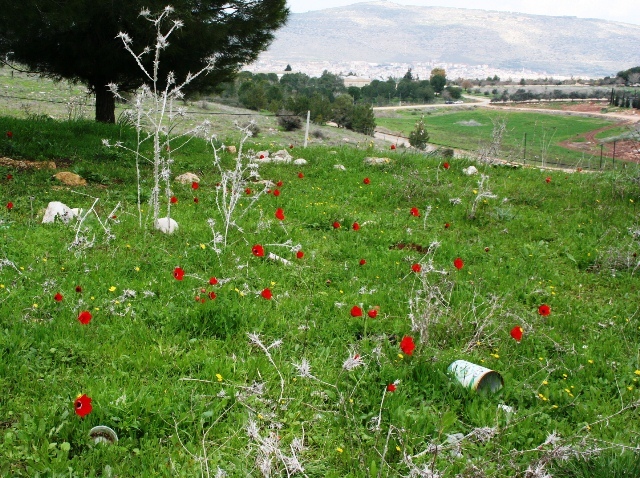 And while efforts to maintain the wildflower population seem to be working, efforts to enforce cleanliness are failing…immensely. Is this the land we're fighting over? 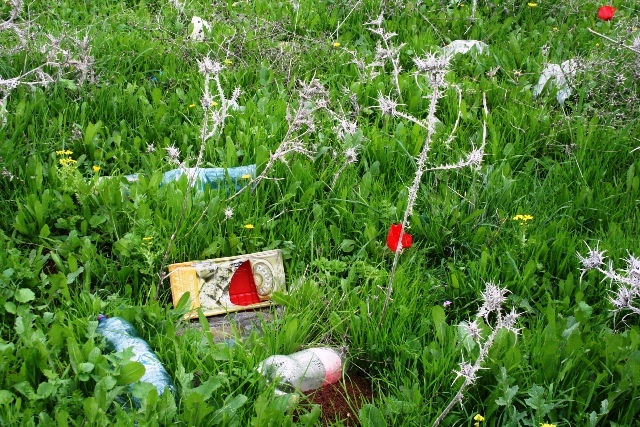 Garbage litters this beautiful land — from fields to parks to beaches to city streets. 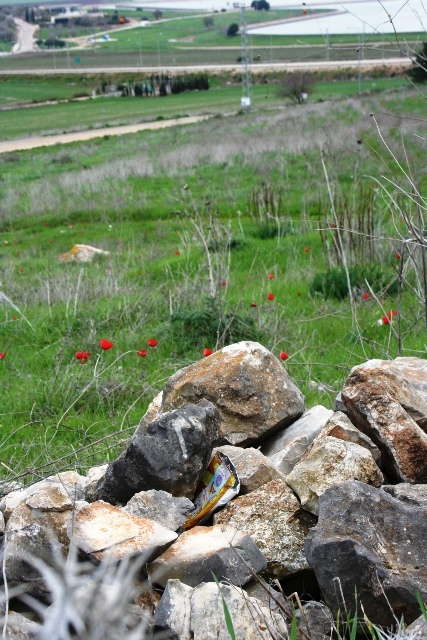 When out and about amongst Israel’s unparalleled landscapes, I often feel transported back to 1970s-era America where it was still socially acceptable to toss trash out the window of a moving car or leave your Happy Meal bag in the mall parking lot next to your car instead of carrying it the extra few steps to the trash can. I see the remains of picnics left behind without a thought in our heavily funded Keren Kayemet national parks — picnics from many season ago no doubt. I grimace as I see plastic bottles floating along the rim of the Kinerret. I am ashamed when I bring tourists to a treasured local landmark, and they have to navigate around discarded cigarette packs and broken beer bottles. How is it that the most contended over real estate on the planet is not cleaner? How is it that our Holy Land is not treated as sacred? How are we so disconnected, so unimpacted by this irony? How is it that we will scream and shout our political battles over borders and boundaries, but we won’t speak up when we see our neighbor litter? How is it that we, as a country, are careful so about Kashrut, but not proactive as individuals in our daily lives with honoring “God’s creation,” our land? When I bring this up among my friends, they often blame our “cousins,” by whom they mean our Arab neighbors. But if that were true, why is there so much trash here on Hannaton? 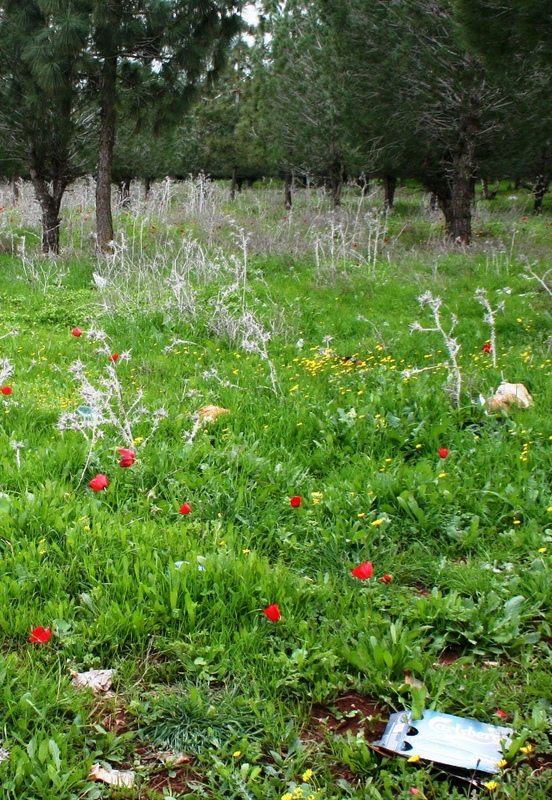 And I don’t mean on the fields just beyond our yishuv gates where our Arab neighbors will often picnic (as will we). But also in the playground our children play in, in our yishuv streets, in our driveways and in our yards? 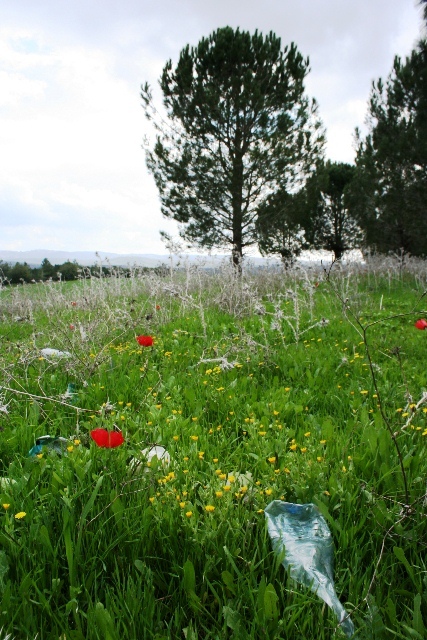 I walked along the beach just outside Haifa a few months ago and it was covered in trash. Again, reminding me of Jersey beaches decades before when we had to be mindful not to walk barefoot on syringes. I don’t imagine our Arab neighbors are coming by with their Bamba bags and dropping them on our Hannaton basketball court. I don’t think our Arab neighbors are sending their dogs over to poop on our playground. But more and more over the years, I’ve come to understand exactly how hand-in-hand these two initiatives are: healing ourselves and healing our planet. They are one and the same. One cannot succeed without the other. And those of us who yearn for peace in this land — in other words, her healing — must understand that this poor land is ravaged both by emotional and physical pain. And to heal her, we must take a holistic approach. 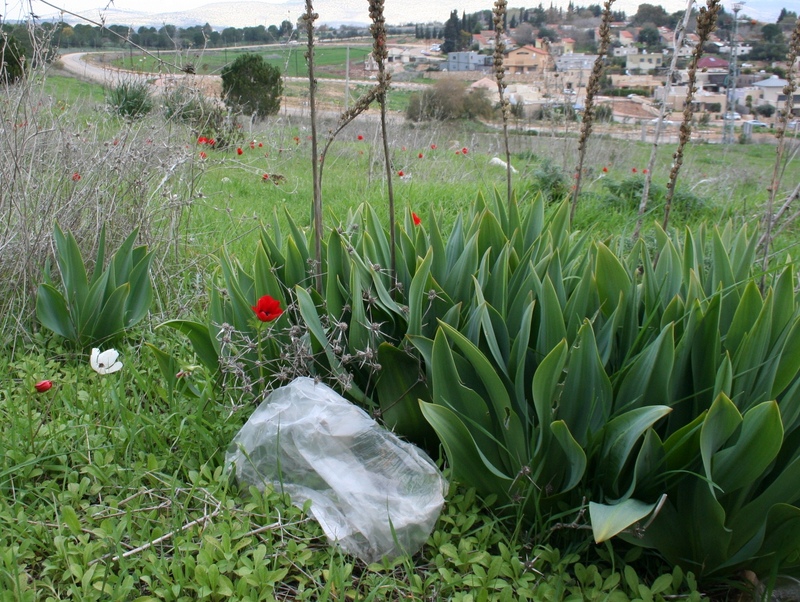 We must understand the unspoken implication of dropping our garbage thoughtlessly onto Israel’s earth, of polluting Israel’s water, of suffocating her with toxic fumes. What message do we send to her when we treat her this way? You wouldn’t court a beautiful woman with screams, bloodshed, and empty plastic bottles and bags, would you? You did it again….brought tears to my eyes with your insight and beautiful writing. Wish there was a way to get this article published in Israeli newspapers. From your lips to editors’ ears and from editors’ ears to their corporate checkbooks!